‘Whispers of Past’ by Peter Wnek beautifully illustrate’s the photographer’s captivating style. ESSEX – Award-winning photographer Peter Wnek explores the ‘Soul of the Landscape’ in his exhibition and sale of fine art photography at the Essex Library, which runs through February. ‘Soul of the Landscape’ celebrates the beauty and spirit of our woodlands and waterways, as seen in Whispers of the Past and its breathtaking view along the Connecticut River. Wnek’s work captures the light and details one might expect from a painting—which is no accident. He has long been inspired by the purity and innocence of the American landscape as portrayed by the 19th century Hudson River painters. “I strive for that same warm light, the luminous or stormy skies, to invoke a charm or a mood,” he explains. Wnek’s photographs often reveal the story of the landscape—its whisper of bygone days, the intrinsic cycles of nature. With a focus on local scenes, this exhibit speaks to the beauty that surrounds us, the coastal vistas and woodland spaces that are unique to our state. In a familiar kaleidoscope of colors, see the rising and setting sun, the harmony of sky and land, the collusion of rock and sea. Featured in this exhibit is Silver Glade, an image of trees on a ridge near Meriden. It recently won the Salmagundi Club of NYC’s 2015 “Henry O’Connor Award” for excellence, portraying the gentler, quieter landscape of New England. It is that voice of New England which Wnek most hopes to capture in his photographs, “those intimate moments of our own landscapes” waiting to be revealed. The exhibit is free and open to the public during the Library’s regular hours. The Essex Library is located at 33 West Ave. in Essex. Call (860) 767-1560 for more information. 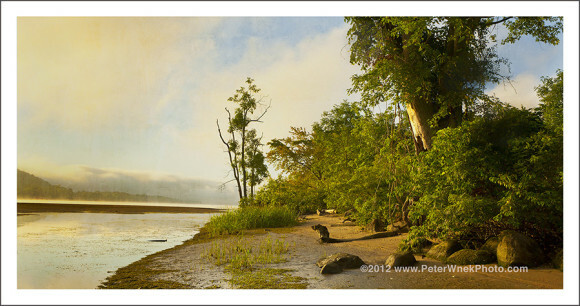 For more information about photographer Peter Wnek, visit www.PeterWnekPhoto.com.